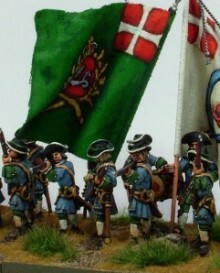 Danish Regiment Fynske or Funen. Painted by Chris Meacham. The flags are hand painted on cotton by Barry. The Danes did not carry pikes during the Nine Year War. This unit fought at the Boyne and in Flanders. This firing line unit is mostly WLOA1 with some WLOA7, WLOA8 and WLOA9 codes. Cavalry. King Billy and Generals in shop today! Have a look in the shop!